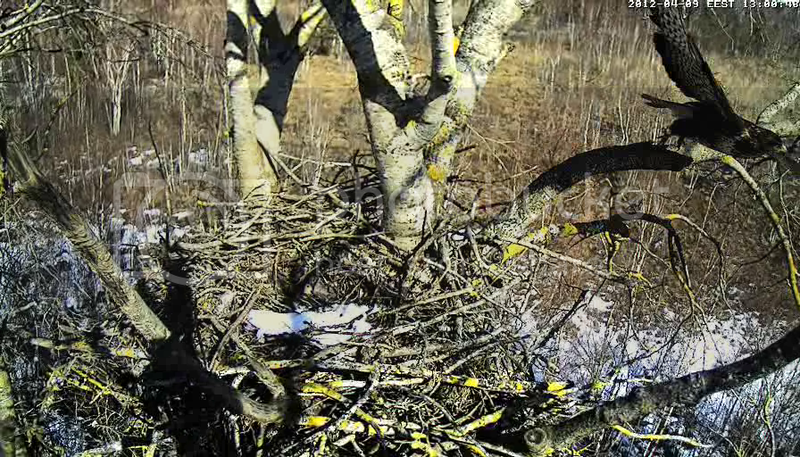 It's nice that a couple appeared, maybe this year the nest won't be empty. What kind of bird is that? Buzzards? Yes, they or another couple were here also last year, Bea. 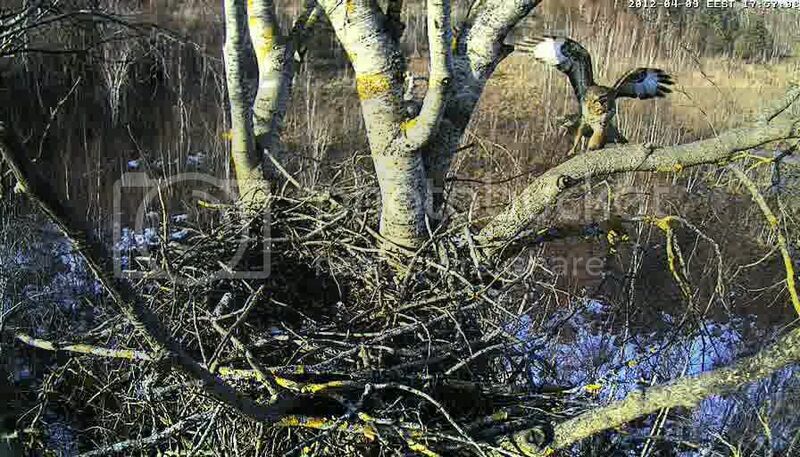 I´m glad to see raptors at this nest. By the way, German members here - did you watch "Terra X" yesterday evening in ZDF? If not, try to find it (Mediathek) - there was a long contribution on WTE, Kieling went up a WTE nest for ringing, shows what food remains were there and also talks about the lead problem! Felis silvestris wrote: By the way, German members here - did you watch "Terra X" yesterday evening in ZDF? I had not the chance to watch it, but I´ll search the Mediathek for it! Fireblade: did they bring something to the nest? i was a bit late to see them. you were there first. i saw that the supposed female was arranging a twig on the back-left rim. Even our friends, the piggies were there! So cute! yeah, what was left of the piggie. 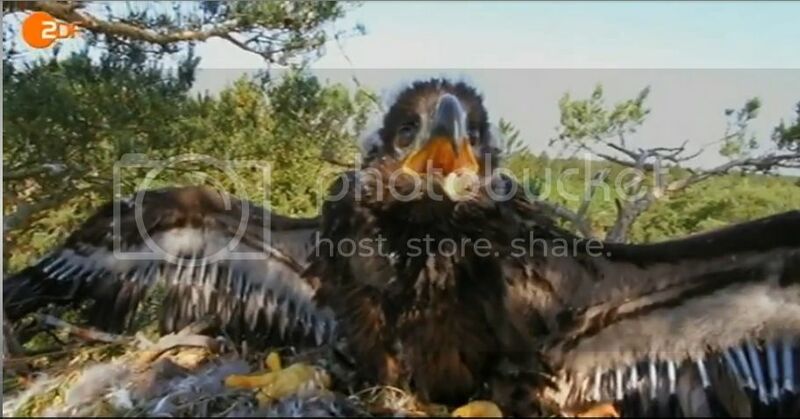 and i'm sure the eaglet was a girl! i don't quite know how appropriate it is to post these pictures here... but it's so cute! Those two buzzards are cute! first they were flying around the nest and meowing... i don't think they brought anything this time either. They are really cute, the nest is so big, they could sit next to each other and still have place! yes, i think we all agree on that. even the crow sounded vicious! Felis silvestris wrote: They are really cute, the nest is so big, they could sit next to each other and still have place! I think it will be ok for the Buzzards to use this nest. Considering what happened with Maisy Mallard, the Buzzards was one of the threats we were afraid of then...it was a Crow who ate the eggs in the end, wasn`t it? 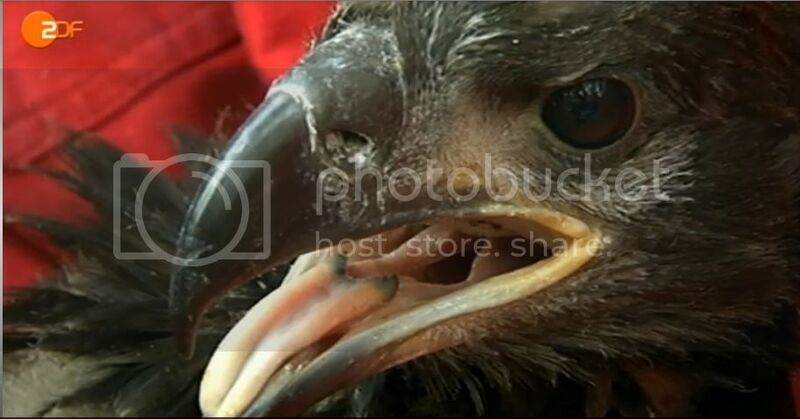 Can a Crow be a threath to the Buzzards? I think it would be very intersting to see the daily life of a Buzzards family because we have a couple in the neighbourhood, but we only see and hear them when they are out flying..
no it wasn't a crow. it was a strange WTE with dark eyes but a plumage of an adult who ate the eggs of Maisy. it was May 4th in the evening. 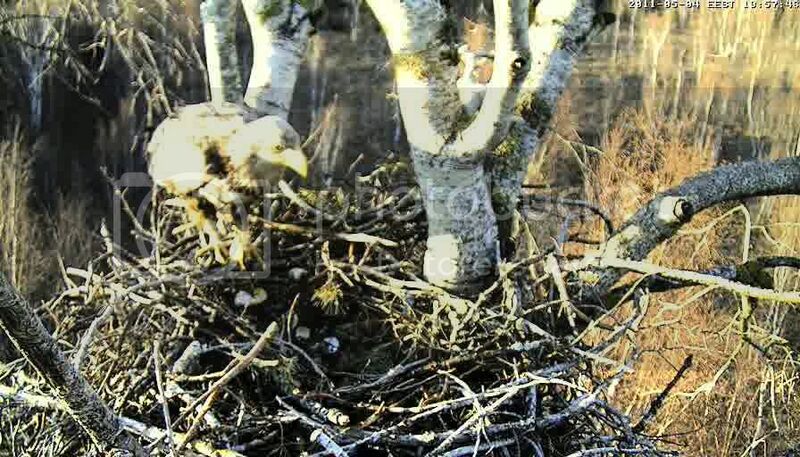 i think that every eagle in about 50 km radius know this nest. ahaa: Felis found a picture already. i think there's a songthrush singing out there. ... and now a buzzard meowing. ... and nearly a minute later the other. ok, this time it brought a twig. 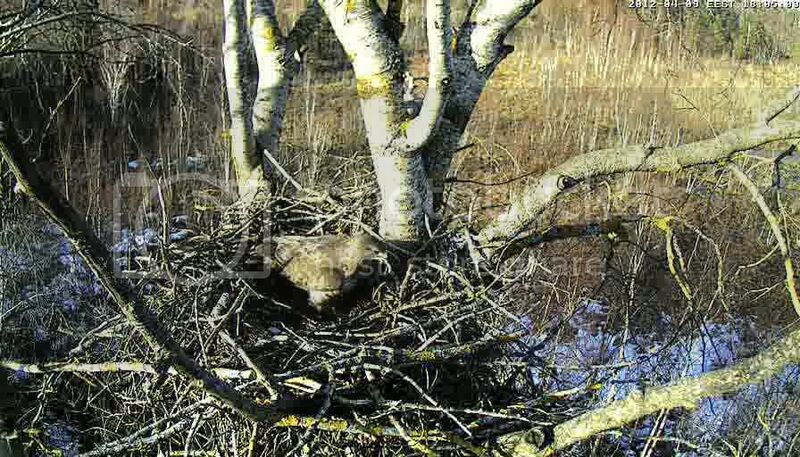 ... i wouldn't be surprised, but on the other hand WTEs take the easiest food so at least they'd scare the incubating mommy- or pappa-buzzard out and then eat the eggs. 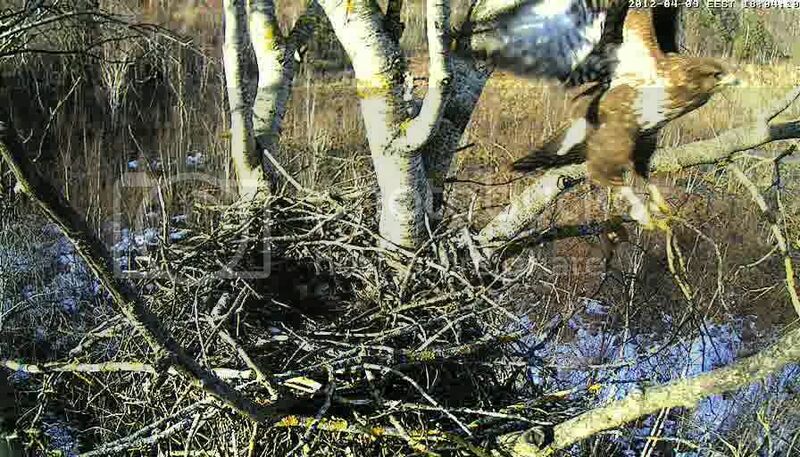 at 17.57 the buzzard came after there had been some meowing around the nest. 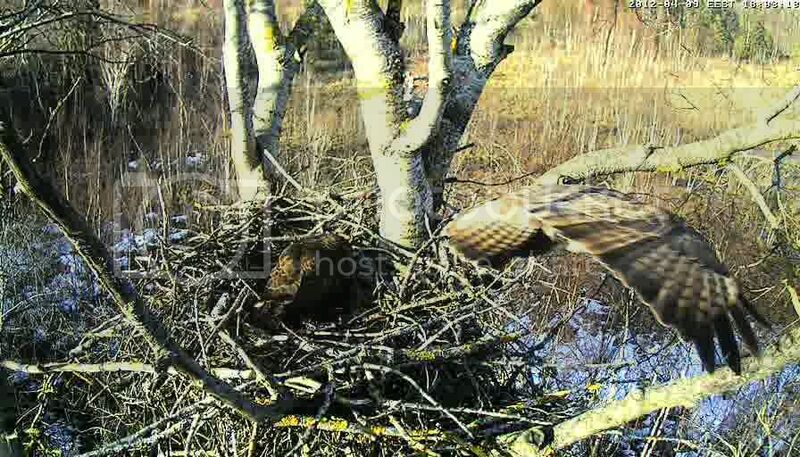 at 18.05 one buzzard brought a little twig, stayed a while and left at 18.06.
ame wrote: ... i wouldn't be surprised, but on the other hand WTEs take the easiest food so at least they'd scare the incubating mommy- or pappa-buzzard out and then eat the eggs.